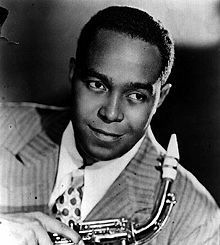 Charles "Charlie" Parker, Jr. (August 29, 1920 – March 12, 1955) was an American jazz saxophonist and composer and, with Louis Armstrong, Duke Ellington, and Miles Davis, among the most influencial figures in jazz history. Early in his career Parker was dubbed "Yardbird," later shortened to "Bird," which remained his nickname for the rest of his life. A founding figure of modern jazz, or bebop, Parker's innovative approach to melody, rhythm and harmony was enormously influential among his contemporaries, and his music has remained an inspiration and resource for later jazz musicians. Not only an innovator, Parker was a virtuoso instrumentalist. Parker also became an icon for the Beat generation, and was a pivotal figure in the evolving conception of the jazz musician as an uncompromising artist and intellectual, rather than just a popular entertainer. The music was jarringly different from the familiar, melodic, danceable jazz of the Big Band era. Indeed, modern jazz provided a new vocabulary for blacks who had the migrated from the rural South into many northern cities. Like modernist art and literature, bebop saw traditional aesthetic approaches as confining and insufficient to answer to the complex experience of an urbanized, industrialized society. At various times, Parker fused jazz with other musical styles, from classical (seeking to study with Edgard Varèse and Stefan Wolpe) to Latin music (recordings with Machito). Parker's tragic, unconventional, and self-indulgent lifestyle became identified in the minds of many musicians in other popular genres with the kind of Bohemian experience considered a precondition for artistic creativity. Drug and alchol abuse in particular, which cut short Parker's life at 34, has been a scourge among musicians and other entertainers, and contributed to a host of social problems. Memorial to Charlie Parker at the American Jazz Museum at 18th and Highland in Kansas City. Charlie Parker was born in Kansas City, Kansas, and raised in Kansas City, Missouri. He was the only child of Charles and Addie Parker. Parker's father presumably provided some musical influence. He was a pianist, dancer, and singer on the T.O.B.A. circuit, although he later became a Pullman waiter or chef on the railways. Parker began playing the saxophone at age 11, and then at age 14 he joined his school's band. Groups led by Count Basie and Bennie Moten were the leading Kansas City ensembles, and doubtlessly influenced Parker. He continued to play with local bands in jazz clubs around Kansas City, Missouri, where he perfected his technique with the assistance of Buster Smith, whose dynamic transitions to double and triple time certainly influenced Parker's developing style. In 1937, Parker joined pianist Jay McShann's territory band, and was able to tour with him to the nightclubs and other venues of the southwest region of the United Staes, as well as Chicago and New York City. Parker made his recording debut with McShann's band. In 1939, Parker moved to New York City. He pursued a career in music, but held several other jobs as well. One of these was as a bus-boy (dishwasher) making $9 a week at Jimmie's Chicken Shack, a restaurant where famous pianist Art Tatum was playing at the time. Parker's later playing was in some ways reminiscent of Tatum's, with dazzling, high-speed arpeggios and sophisticated use of harmony. In 1942, Parker left McShann's band and played with Earl Hines for eight months. The early history of bebop is difficult to document because of a strike by the American Federation of Musicians, which meant that there were no official recordings during most of 1942 and 1943. Nevertheless, it is known that Parker was one of a group of young musicians who congregated in after-hours clubs in Harlem, such as Minton's (Minton's Playhouse) and Monroe's. These young iconoclasts included trumpeter Dizzy Gillespie, pianist Thelonious Monk, guitarist Charlie Christian, and drummers Max Roach and Kenny "Klook" Clarke. It was Monk who summed up their approach in the famous quote, "We wanted a music that they couldn't play"—"they" being either the (mostly white) band leaders who had taken over and profited from swing music or unwelcome fellow musicians wishing to jam with Parker, Gillespie, and others. The group played in venues on the now famous 52nd Street, including Three Deuces and The Onyx. In his time in New York City, he also learned much from notable music teacher Maury Deutsch. By now, Parker was emerging as a leading figure in the nascent bebop scene. According to an interview Parker gave in the 1950s, one night in 1939, he was playing "Cherokee" in a jam session with guitarist William "Biddy" Fleet when he hit upon a method for developing his solos that enabled him to play what he had been hearing in his head for some time, by building chords on the higher intervals of the tune's harmonies. In reality, the birth of bebop was probably a more gradual process than this story reports. Early in its development, this new type of jazz was rejected and disdained by many older, more established jazz musicians, whom the beboppers in response called "moldy figs." However, some musicians, such as Coleman Hawkins and Benny Goodman, were more positive about its emergence. It wasn't until 1945 that Parker's collaborations with Dizzy Gillespie had a substantial impact on the jazz world. One of their first (and greatest) small-group performances together was only discovered and issued in 2005—A concert in New York's Town Hall on June 22, 1945 (now available on Uptown Records). On November 26, 1945, Parker led a record date for the Savoy record label, which was once marketed, during the Gramophone record or LP era, as the "greatest Jazz session ever." Although this may have been hyperbole, the Savoy sessions produced an astounding collection of recordings—in spite of Dizzy Gillespie having to deputize on piano for some of the tracks. Among the tracks recorded during this session are "Ko-Ko" (based on the chords of "Cherokee"), "Now's the Time" (a twelve bar blues incorporating a riff later used in the late 1949 R&B dance hit "The Hucklebuck"), "Billie's Bounce," and "Thriving on a Riff." Shortly afterwards, a trip to Los Angeles by the Parker/Gillespie band to fulfill an engagement at Billy Berg's club was less than successful. Most of the band soon decided to return to New York. Parker though, stayed in California, where his extravagant lifestyle was to catch up with him. As a teenager, he had developed a morphine addiction while in a hospital after an automobile accident, and subsequently became addicted to heroin, which was to plague him throughout his life and ultimately contribute to his death. Parker's heroin habit caused him many problems with missed gigs and getting fired for being high. In order to keep his "buzz" going he would frequently resort to "busking" on the streets. Parker's addiction is a prime example of the many connections between narcotics and jazz during this period. Although he produced many brilliant recordings during this period, Parker's behavior became increasingly erratic. Heroin was difficult to obtain after his dealer was arrested, and Parker began to drink heavily to compensate for this. A recording of "Lover Man" for the Dial record label from July 29, 1946, provides evidence of his condition. Reportedly, Parker could barely stand during the session and had to be physically supported by others in order to keep him positioned properly against the microphone. Some, including Charles Mingus, consider it among his greater recordings despite its technical problems. Nevertheless, Bird hated the recording and never forgave his producer Ross Russell for releasing the sub-par record (and re-recorded the tune in 1953 for Verve Records, this time in stellar form, but perhaps lacking some of the passionate emotion in the earlier, flawed attempt). A few days after the "Lover Man" session, Parker was drinking in his hotel room when he set fire to his mattress with a cigarette, then ran through the hotel lobby wearing only his socks. He was arrested and committed to Camarillo State Hospital, where he remained for six months. Coming out of the hospital, Parker was initially clean and healthy, and proceeded to do some of the best playing and recording of his career. Before leaving California, he recorded Relaxin' at Camarillo, in reference to his hospital stay. He returned to New York and recorded dozens of sides for the Savoy and Dial labels that remain some of the high points of his recorded output. Many of these were with his so-called "classic quintet" that included trumpeter Miles Davis and drummer Max Roach. The highlights of these sessions include a series of slower-tempo performances of American popular songs including "Embraceable You" and "Bird of Paradise" (based on "All the Things You Are"). Parker's soaring, fast, rhythmically asymmetrical improvisations could amaze the listener; nevertheless, close inspection shows each line to hold a complete, well-constructed phrase with each note in place. Parker's harmonic ideas were revolutionary, introducing a new tonal vocabulary employing 9ths, 11ths and 13ths of chords, rapidly implied passing chords, and new variants of altered chords and chord substitutions. His tone was clean and penetrating, but sweet and plaintive on ballads. Although many Parker recordings demonstrate dazzling virtuoso technique and complex melodic lines—the early Ko-Ko is a superb example—Parker was also one of the great blues players. His themeless blues improvisation Parker's Mood represents one of the most deeply affecting recordings in jazz, as fundamental as Armstrong's classic West End Blues, from only twenty years before. Despite many of the compositions which bear his name being based on earlier pieces from the American songbook, Parker's legacy as a deviser of jazz standards is significant. Such pieces include Anthropology, Confirmation, and Yardbird Suite, which have been performed by numerous other musicians. Like his solos, his compositions are characterized by long, complex melodic lines and a minimum of repetition. For example, an eight-bar segment will not contain any repeated motifs or sequences. By 1950, much of the jazz world was under Parker's sway. His solos were transcribed and copied as legions of saxophonists imitated his playing note-for-note. In response to these musical fans, Parker's erstwhile band mate Charles Mingus titled a song, "If Charlie Parker were a Gunslinger, There'd Be A Whole Lot of Dead Copycats," featured on the album Mingus Dynasty. In this regard, he is perhaps only comparable to Louis Armstrong. Both men set the standard for their instruments for decades, and very few escaped their influence. In 1953, Parker was invited to perform at Massey Hall in Toronto, Canada, where he was joined by Dizzy Gillespie, Charles Mingus, Bud Powell, and Max Roach. Unfortunately, the concert clashed with a televised heavyweight boxing match between Rocky Marciano and Jersey Joe Walcott and as a result was poorly attended. Thankfully, for the sake of posterity, Mingus recorded the concert, and the album Jazz at Massey Hall is often cited as one of the finest recordings of a live jazz performance. One of Parker's longstanding desires was to perform with a classical string section. He was a devoted fan of European classical music. Contemporaries reported that he was keenly interested in the music of Igor Stravinsky, and longed to engage in a project akin to what became known as Third Stream Music. This was a new kind of music, incorporating both jazz and Euro-classical elements as opposed to merely incorporating a string section into performance of jazz standards. When he did record and perform with strings, some fans thought it was a "sell out" and a pandering to popular tastes. Time demonstrated Parker's move a wise one. Charlie Parker with Strings sold better than his other releases, and his version of "Just Friends" is seen as one of his best performances. In an interview, he considered it to be his best recording to date. Parker was known for often showing up to performances without an instrument and borrowing someone else's at the last moment. At more than one venue, he played on a plastic Grafton saxophone. Subsequently, saxophonist Ornette Coleman used this brand of plastic sax in his early career. On one particular occasion before a concert in Quebec, he had sold his saxophone to buy drugs, and at the last minute, he, Dizzy Gillespie, and other members of Charlie's entourage went running around Quebec trying to find a saxophone, at which time the only saxophone he could have played was the plastic one. Parker died while watching Tommy Dorsey on television in the suite at the Stanhope Hotel belonging to his friend and patroness Nica de Koenigswarter. Though the official cause of death was pneumonia and a bleeding ulcer, his death was doubtlessly hastened by his drug and alcohol abuse. The 34-year-old Parker was so haggard that the coroner mistakenly estimated Parker's age to be between 50 and 60. Parker left a widow, Chan Parker, a daughter, Kim Parker, also a musician, and a son, Baird Parker. Many jazz fans and musicians would agree with critic Scott Yanow's assessment that "Parker was arguably the greatest saxophonist of all time." An 1988 biographical film called Bird, starring Forest Whitaker as Parker and directed by Clint Eastwood, was released in 1988. 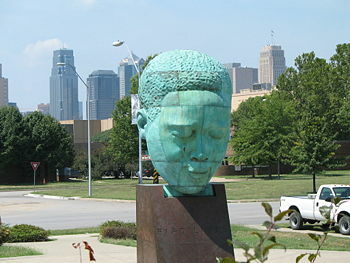 A memorial to Parker was dedicated in 1999 in Kansas City at 17th Terrace and the Paseo, next to the American Jazz Museum featuring a ten-foot tall bronze head sculpted by Robert Graham. Parker's performances of I Remember You and Parker's Mood were selected by Harold Bloom for inclusion on his American Sublime short list of the best of the twentieth century. In 2005, the Selmer Paris saxophone manufacturer commissioned a special Tribute to Bird alto saxophone, commemorating the 50th anniversary of the death of Charlie Parker (1955-2005). This saxophone will be built until 2010, each one featuring a unique engraving and an original design. In August each year, there is a Charlie Parker Festival at Tribes Gallery in New York (285 3rd Street, New York City, NY 10009) in celebration of his life and career. ↑ Biography pbs.org. Retrieved September 11, 2008. ↑ Charlie Parker Biography allmusic.com. Retrieved September 11, 2008. Charlie Parker Discography Project, Jazz Discography Project. "Thinking about Charlie Parker", Bird Lives. "Charlie Parker Licks", Your Guide to Jazz Guitar. "Charlie Parker", Find A Grave.